I took a trip to Nova Scotia over the summer to look at possibly relocating from the west coast to the east. Mainly because I could buy a moderately sized fishing village for the same price as a condo in Vancouver. But also to celebrate our nation’s 150th birthday in an epicentre of Canadian history. Nova Scotia is a wonderful place and the people that live there are very lucky. I regrettably won’t be able to move, the insurance industry there is not as big as I’d hoped. The natural beauty, great people and historical importance to not only Canada, but the world, made it a truly amazing place to visit. I’ve never felt so sad to leave somewhere, and I hope to return very soon. 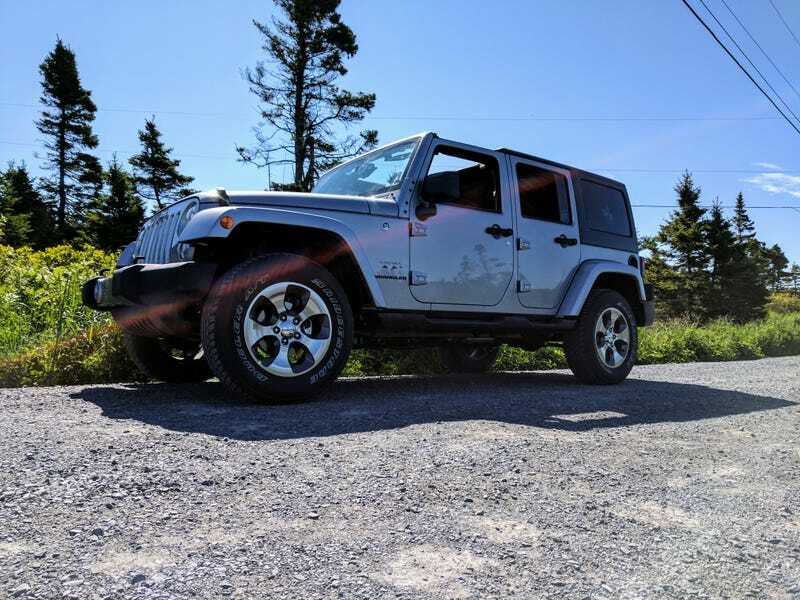 I rented a 2017 Jeep Wrangler Sahara Unlimited, fresh of the dealer’s lot the day before, so unlike most rentals, it was clean and worked well. It had 50km on it when I got in. First impressions were that the build quality and material quality left something to be desired. But after driving for a while (especially with the Freedom Panels® removed) you get an appreciation for why these are so beloved by their owners. The totally open cabin filled with sunshine and the fresh Atlantic air. The Jeep felt like less of a conveyance and more part of the adventure as we rolled along the coast. Now, I’ve only ever really driven on pavement. I avoid non-paved surfaces as much as possible. I’ve never even taken one of my vehicles on a gravel road, because I am afraid of rocks damaging the paint. But, in the Jeep, I went down every weird bush road, every gravel road and onto any surface I could drive over and not worry about being stuck. This is when I really understood why people buy these. They aren’t an A to B, they are an A to A(dventure) car. My favorite part about driving the Jeep however, was the fabled “Wrangler Wave”. I had no idea how widespread this is! Even though I’m driving a Soccer Mom spec Wrangler (stock, automatic, 4 door) every bro in an custom offroad rig is greeting me with a friendly wave! This made my desire for a Wrangler of my own even stronger. When I arrived back in Vancouver however, I realized that I commute 2.5 hours a day, gas is $1.40 a litre and the Wrangler drives badly on the highway. So I had to let the dream die. Back to Nova Scotia itself, While there, I stumbled upon a village called Mahone Bay, where, as it turns out a fellow Oppo RallyDarkstrike happens to live. This was back in July, before I had joined Oppo, so I had no idea. This is the only place I’ve ever experienced that felt immediately like home to me. It was pretty and quaint with lots of little shops and restaurants. It reminded me so much of my own village. I mean, it has a candy/bike store called “Sweet Ride”. That’s the level of quaintness we’re dealing with.